Store and organize jewelry and accessories stylishly with the Beautify Wall Mounted Jewelry Cabinet and Mirror. An elegant and functional way to store earrings, necklaces, rings, bracelets and charms, so they’re always neat, easily accessible and ready to wear. Once you’ve chosen your accessories for the day, you can admire how fantastic they look in the large built in full length dressing mirror or the smaller interior mirror. The cabinet comes complete with space for 72 pairs of earrings and 44 rings, plus eight hooks on the inside of the door and nine hooks inside the cabinet. There are also three spacious shelves – perfect for storing larger items such as perfume bottles, glasses and watches. Constructed from high quality painted white MDF with a magnetized door clasp, the cabinet complements a wide variety of decors. Soft black velvet interior lining adds a luxurious touch and protects jewelry against scratching. Space isn’t an issue with the versatile Beautify Jewelry Cabinet, which features a slim profile and can be conveniently wall mounted or installed against a door. Quick and easy self-assembly – instructions and mounting hardware included. Size: 43.3 x 12.4 x 3.5 inches. Please note: jewelry and accessories are for illustration purposes only and are not included. 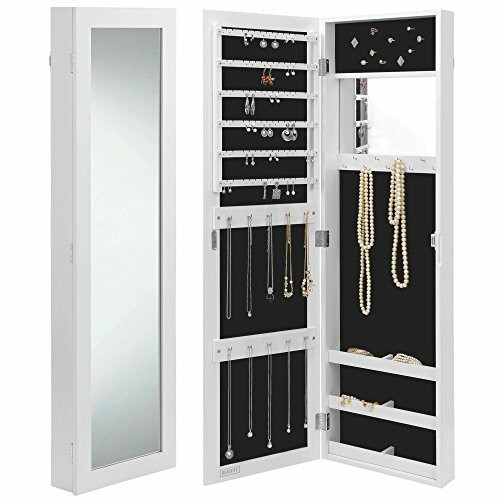 Wall / door mountable mirrored jewelry cabinet – plenty of room for even the largest jewelry and accessory collections! Easy to assemble. Size: 43.3 x 12.4 x 3.5 inches.